Among them are Jason Kessler who helped organise a far-right march in Charlottesville, and white supremacist Richard Spencer. English Defence League founder Tommy Robinson also had his badge removed. Twitter said the badge was being interpreted as an "endorsement or an indicator of importance" and said it would change the scheme. The blue badge was first introduced to indicate the authenticity of prominent profiles on the social network. Originally the site had chosen who to verify, and usually reserved the status for celebrities, public officials and journalists. In July 2016, it opened the scheme up to the wider public and let anybody apply for a verified badge. Last week, the social network was criticised for giving Mr Kessler a verified badge, and on 9 November halted its verified profile scheme. It said it had not intended the blue badge to be an endorsement of views shared. "We gave verified accounts visual prominence on the service which deepened this perception," it said. "We should have addressed this earlier but did not prioritise the work as we should have." Twitter said it was designing a new "authentication and verification programme", but in the meantime would "remove verification from accounts whose behaviour does not fall within the new guidelines". The new guidelines say verified status can be lost if a person breaks Twitter's rules or "promotes hate" on the basis of "race, ethnicity, national origin, sexual orientation, gender, gender identity, religious affiliation, age, disability, or disease". It said behaviour both on and off Twitter would be taken into account. Some of those who had their verified badges removed said the new policy was being applied inconsistently and highlighted accounts of disgraced celebrities that had not lost the icon. 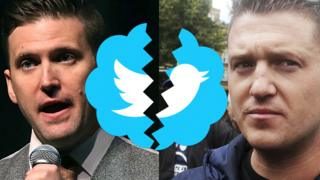 Mr Kessler suggested Twitter had changed its rules to "censor" his views, while Mr Robinson said Twitter now classed the truth as "hate speech".